In old fashioned law firm interviews, you could often get away with putting on the charm and speaking praisfully about the company you were interviewing at. Nowadays, due to the large number of applicants, competition is tough and you need more skills to call upon in your arsenal if you want to achieve success. Keeping up-to-date on relevant legal news is a must and can be something you may be called upon to discuss at any point in your legal career. In this article we discuss the top 10 tips for keeping up-to-date with legal news. We’re going to start with the most obvious way to stay on top of legal news and that’s to keep an eye out for the ‘Hot Topics’ section on the TLP website. Here you can find out about the latest developments in the legal world, which will help anyone who wants to keep on top of their legal current affairs knowledge. It’s a great idea to get on social media, for example: twitter, Instagram or Facebook and start following the companies or professionals you aspire to to work with. They will regularly post about industry information and the latest job postings. In my former job, in the reporter’s office, we were tasked with checking Twitter for one hour every morning for news, so if the pros do it you need to as well. This should be a no brainer. 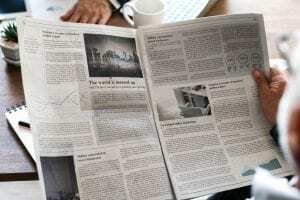 The traditional source of news is the newspapers and nowadays you can get the apps for most papers on your smart phones, which can be tailored to the specific news you want to read. I follow a number of news feeds, but would recommend using The Times since it has a high readership amongst lawyers and a very interesting law section. In addition, most university students have access to free subscriptions to newspapers’ digital content, as well as law journals that are also free to read. So, it’s always best to go into your library to check the news at least once or twice a week. A number of lawyers actually run regular shows on law. I myself was involved in a law radio show for over 2 years as well as being an avid listener. TLP also runs its own law podcast having interviewed special guests such as Cherie Blair. There are a number of networks out there that have a presence on social media. These can be found online and on social media sites such as LinkedIn. Try to pick networks aligned to your interests as well as your future career specialism. Most companies and bloggers have newsletters. These are weekly or daily article updates sent directly to your email or home address providing insight into the business and its sector. Conferences, workshops, webinars, law talks and open days are all great ways to keep up-to-date with legal news. Plenty of these are run by prestigious companies that will usually always have the opportunity to network and ask questions at the end. I look on Eventbrite for any events that relate to law and it is surprising to find that many of these vents aren’t overbooked, as it is a chance to network with top law professionals. Similar to blogs, a number of companies and lawyers release articles regularly aimed at attracting new clients or informing existing ones as a way to demonstrate their expertise. These articles are open to anyone to read and offer real insight into what companies are doing at the moment. For example, if you wanted to know what the biggest hurdles facing Clifford Chance right now are, you could read the ‘thought leadership’ section of their website discussing challenges to their clients. What I have found from using various sources is that information tends to get spread around from sources to sources. i.e. news in the Economist may appear a week later in FT Sunday Edition, with the same news often then appearing in The Sun later that week. The important thing to remember here is that you need to read news from a range of sources as rarely one source will provide an accurate account.